Sunday, the new administration provided the out going administration a warning, via former Ambassador John Bolton. The warning- LEAVE ISRAEL ALONE - don't pull any "stunts" before you leave office. The "stunts" the new administration, and I personally am concerned about, a UN Resolution demanding a return to the "pre-1967" ceasefire lines, or acknowledgement of Palestine as a nation. The second is a grave concern, but the first would be tantamount to a betrayal of every Jew around the world. Both would be a betrayal by the US of an ally and the only true democracy with freedom of speech, religion and the press in the region- as well as the only country in the area where gays and lesbians can live without fear of arrest, torture and possible execution, and the only country in that area where women have the same rights and freedoms as men. Israel, after all, elected the World's fourth female Prime Minister, Golda Meir, years before the British would elect Margaret Thatcher. When President Obama first took office, I was not as concerned about Israel, because Rahm Emanuel was Chief of Staff. Mayor Emanuel left the US in 1991 to serve with the Israeli Defense Forces in the Gulf War. Rahm Emanuel's father, Benjamin Emanuel, was born in Jerusalem. His uncle was killed in the revolts and riots in 1933 in Jerusalem, ordered by the Grand Mufti of Jerusalem, Mohammed Amin al-Husseini, after he had consulted with the Nazi German Consulate in Jerusalem. Benjamin Emanuel was a member of the Irgun- a pre-1948 highly militant pro-Jewish organization that the British labeled a "terrorist" organization. Where the Haganah (the other major pre-1948 Jewish "militia") would smuggle arms and people into the country, the Irgun was more "active" - such as blowing up the British military headquarters at the King David Hotel. Rahm Emanuel's pro-Israeli stance is at least for me, one I would not question. Since he left the White House, I have been concerned. There are two things with regard to Ambassador Bolton's statement today and President Obama's prior statements that must be made perfectly clear. First, a return to the pre-1967 borders, which President Obama has advocated in the past, means one specific surrender of territory which will not be tolerated by the Likud Party, Zionist, many Orthodox, many Christians and may start a war. Returning to pre-1967 borders means the SURRENDER OF JERUSALEM, and the Western, or Wailing Wall. Other portions of the West Bank are not as "volatile" of an issue. Jerusalem is a flashpoint. The Golan Heights, seized also in 1967, are of paramount strategic importance, as these mountains, prior to the 1967 Six Day War were used to hammer settlements in the Galilee region with artillery from Syrian gun emplacements. Secondly, and perhaps the most inconvenient truth of the matter, is there has NEVER BEEN A NATION OF PALESTINE. What would be done would be to create a new nation called Palestine which historically has never been a nation. To explain, a review of world history is required. We know Israel existed under King David. This is now proven history with archeological backing outside the Bible. The Tel-Dan Stele Inscription speaks of a battle won by the King of the House of David (possibly King Asa but that varies by archeological interpretation). The same battle is also recounted in I Kings. Israel, being the crossroads of Africa and Asia, and having a huge salt supply (area surrounding the Dead Sea) was in the ancient world of great strategic importance, and was subject to being attacked by every nation from Egypt under Pharaoh Sheshonq (Shishak), to the Babylonian and Persian Empires, to Alexander the Great (and the Ptolemy's) to the Roman Republic and Empire with periods between the Empires being self ruled. It was during the 5th Century BC that the Greek historian Herodotus used the term Palaistinē to refer to the lands northeast of Egypt. This was derived from a Hebrew and Egyptian word, "peleshet" to describe the area occupied by the Philistines. Under the Second Triumvirate of the Roman Republic, the joint rule of the Empire by Marcus Antoninus (Marc Anthony), Octavian Caesar (later Caesar Augustus) and Lepidus, King Herod the Great was named, by Marc Anthony (eventually approved by Octavian and Lepidus) King of the Jews, with his territory being Judea, Samaria and the Galilee (modern Israel's territory). King Herod pledged allegiance to Octavian when it became apparent Marc Anthony and Cleopatra were doomed. Uprisings in 70 AD, led to the destruction of the Second Temple of Jerusalem, built by Herod the Great. The uprising culminated with the siege of Masada, by General Flavius Silva. Empires Hadrian in 118 AD promised a right of return of Jews who had been deported after the previous revolt and a rebuilding of the Temple in Jerusalem. Hadrian went back on his promise. This resulted in the Bar-Kokhba Revolt of 132-135 AD. After this, Hadrian essentially outlawed Judaism. Empire Hadrian had maps changed to say PALÆSTINA, to reduce Jewish association with the land. Like with the Roman persecution and outlaw of Christianity, the religion survived. Some Jews remained in Israel, but many hundreds of thousands (estimated) were en-slaved and deported across the Roman Empire. In 330 AD the Roman Empire split into the Western and Eastern Roman Empires, with the eastern eventually being named the Byzantine Empire. The Byzantine-Sasanian War of 602-628 resulted in the loss of all territory from Egypt to Syria to the Sasanian Empire of Persia. It should be noted that Jews of Judea, Samaria and Galilee fought against the Byzantine Empire. The Sasanian Empire came under Muslim rule as this was also the time of the ascendency of the Islamic faith. The Crusades eventually placed Jerusalem and much of Israel under the rule of the Catholic Church. Godfrey of Bouillon was first King of Jerusalem in this period (although his brother Baldwin I was the first to use title King) with the last being Henry II in 1291. In 1299 the Ottoman Empire was established. Constantinople fell. The lands of modern Israel were part of the Ottoman Empire as were the lands of Egypt, Syria, Lebanon, Turkey, parts of Iraq and lands to the horn of Africa. The Ottoman-Turk Empire joined with Germany and the Austro-Hungarian Empire in WWI against the British Empire, France, and Russia. Historically, from the time of the fall of the Roman Empire, until the fall of the Ottoman-Turk Empire, no nation of Palestine ever existed. Under the Ottoman-Turk Empire, the area was called South Syria. Palestine was a "map label," first used by Rome as an anti-Jewsish measure to eliminate their homeland. These maps were then used by early the early Catholic Church of the Roman Empire to refer to the Holy Lands. The maps since Hadrian had been using the term Palæstinia, and the Latin Church continued this. In the late 1800's saw the beginning of the First Aliyah- the return of Jews to Eretz-Israel. The pogrom's in Russia in the 1880's were a catalyst. There was also a large migration of the Jewish community of Yemen. Twenty-eight colonies were established, much of it on swampy land and land considered uninhabitable by Arabs and Jews living in the area at the time (some few Jews have always lived in Jerusalem and the surrounding areas since well before the fall of the Roman Empire and before). This land was purchased from Arab owners by the Jewish settlers with some funding come from American and European Jewish families. Colonies founded in this time include two neighborhood s of Tel-Aviv, although this city was not founded until the Second Aliya. Generally the Ottoman-Turk Empire, and it's Arab citizens lived peaceably with the Jewish Settlers of this period. The Jewish settlers drained the swamp lands, created irrigation, and generally created a growing agricultural base. The Kibbutzim were also formed. World War I, is the heart of the current controversy. The defeat of the Ottoman-Turk Empire was of great importance to the Allies, as was the defeat of Germany and Austria-Hungary. To aid in the defeat, the British entered into two separate and in some ways conflicting agreements- the Balfour Declaration and the McMahon-Hussein Correspondence. The purpose behind the Balfour Declaration was to encourage Jews fleeing the pogrom's of Russia and other parts of Europe to join the Jewish Legion, five brigades of the British Army who fought the Ottoman-Turk's. This was also an attempt to destabilize the Bolshevik's, as there were many Jewish members of the Bolshevik Party, and it was thought this might prevent a Russian withdrawal from the war- or at least encourage Russian Jews to continue fighting. There is also conjecture that the Balfour Declaration was made to encourage American Jews, of which there were approximately 3 million at the time, to encourage US entry into WWI. Two of President Wilson's senior advisors, Louis Brandeis and Felix Frankfurter were believed by the British to be avid Zionist. The McMahon-Hussein Correspondence was a series of letters between Hussein bin Ali, Sharif of Mecca and Sir Henry McMahon, the British High Commissioner of Egypt. In the correspondence between July 14, 1915 and January 30, 1916, Sir McMahon promised independent nation status to wholly Arab occupied lands in the borders proposed by the Sharif of Mecca. There were several caveats to this, including that this not interfere with interest of allies of the British Empire, namely France. There are two very important points of the McMahon correspondence. First, the letters named Arab occupied lands. The area of Jerusalem, as well as the area south and north was not only Arab occupied. By the time of the correspondence, there were 28 Jewish settlements in the land. A number of Jews had lived in Jerusalem- since long before the Roman occupation. Additionally, there was also a Druse population in the area. maps he sent in the McMahon correspondence. The area around Jerusalem was to be the Independent Sanjuk of Jerusalem. North of Jerusalem, the New Testament Samaria, home of the Good Samaritan, was to be the Sanjuk of Balqa, and the Galilee was to be the Sanjuk of Acre. This again shows that even in the 1915-1916 time frame, in the agreement for Arab Independence, the leaders of the Arab world did not acknowledge any land known as Palestine nor a people know as Palestinians. British Colonel T. E. Lawrence, known to most by the name "Lawrence of Arabia" obtained the blessing of the Sharif of Mecca, and raised any Arab army to fight the Turks, in the name of the Sharif's brother Prince Faisal. Lawrence assured the Arabs they were fighting for a new Arab Nation- which had not existed for hundreds of years. Lawrence was responsible, at least partially, for uniting the various tribes and was an advocate of Arab independence. Navy to be used to control the North Sea and keep the Atlantic open. Additionally Japan exported several dozen destroyers to France. The summary of the Sykes-Picot agreement was that it divided the Middle-East between Great Britain, France and Russia. This agreement was made with Tsar Nicholas' government, and was not disclosed to the Sharif of Mecca in the McMahon Letters. Lawrence of Arabia denied knowledge of Sykes-Picot to Prince Faisal, although it is possible that Col. Lawrence suspected some agreement as to the division of the Middle-East had been made despite assurances to him, and his assurance to the Arab Tribes. 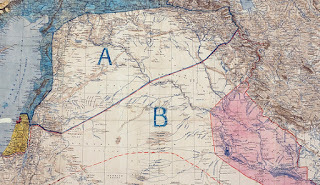 Sykes-Picot was exposed in 1917 by the Bolsheviks and then western press, after the agreement was found within the papers of the deposed Tsar of Russia. Prince Faisal was aware of Sykes-Picot when the Arabs under Lawrence took Damascus, and questioned General Allenby about it. 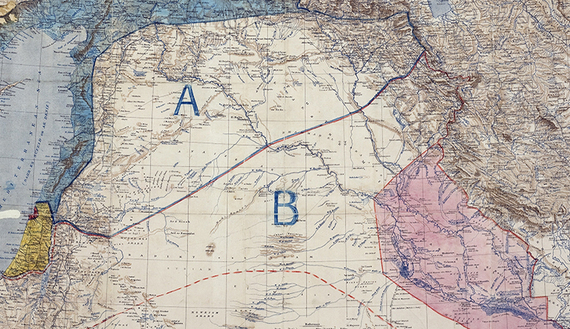 Again, Col. Lawrence stated he had known nothing of Sykes-Picot. After the defeat of the Central Powers, the Paris Peace Conference of 1919 began culminating in the Treaty of Versailles and the Treaty of Sèvres. Col. Lawrence was present as was Prince Faisal - now King Faisal. The Balfour Declaration was included within the Treaty of Sèvres which in essence broke up the entire middle east basically into the countries we see today between the French and British. It should be noted that the "drawing of boundaries" was somewhat arbitrary, without due regard to culture, tribes or other considerations. 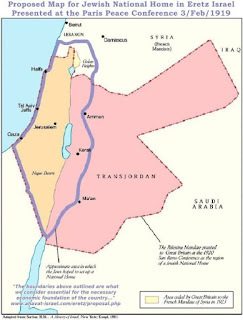 "Trans-Jordan" was drawn on the map which included the entirety of the borders of modern Israel and Jordan. 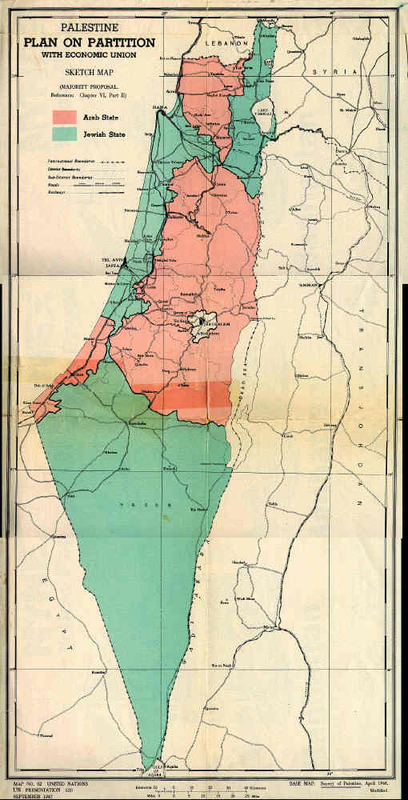 A proposed map of Eretz-Israel was presented at the Paris Conference. 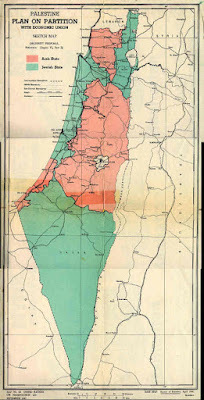 The League of Nations granted the Great Britian the "Palestine Mandate" in 1920 with a portion of the Golan Heights ceded by the French in 1923. The years between 1919 and 1923 saw the Third Aliyah. Jewish population was over 90,000. Land was purchased. Swamps were drained and roads built. Agriculture increased. An elected assembly and the Haganah were also established. Anti-Jewish policies in Poland saw the Fourth Aliyah between 1924 and 1929 with an additional 60,000 Jews permanently settling. This also saw the expansion of industry and the growth of Tel Aviv. The rise of the Nazi Party in Germany led to the Fifth Aliyah. Approximately 230,000 Jews emigrated bringing the total Jewish population to approximately 450,000. The port of Haifa was constructed. It was during this time that the Grand Mufti of Jerusalem called for violent attacks upon the Jewish population, which until that time had lived generally in peace with local Arabs. The British referred to these attacks and murders as "disturbances." This also led to British restrictions on Jewish immigration, which resulted in the Haganah beginning the Aliyah Bet - clandestine immigration. The main purpose of Aliyah Bet during WWII was the rescue of Jews from European extermination. During the war years, the Jews again volunteered to fight with the British and the Jewish Brigade was officially organized. Made up of Zionist and Jews from "Eretz-Israel," the brigade served until it was disbanded in 1946. After the war, the British limited Jewish immigration to 18,000 per year. The British also imposed a naval blockade of the coast and forced ships, such as the Exodus with her 4500 passengers, to return to camps in Europe. The Grand Mufti of Jerusalem took a radically different course during WWII. After being expelled by the British in 1937 following the 1936 Riots. He met with Hitler in 1941, and recruited Muslim men (primarily European Muslims) to join Waffen-SS auxiliary units. Although he was captured by the French on a War Crimes warrant, he escaped to Egypt and continued working to destroy Israel until his death in 1974. 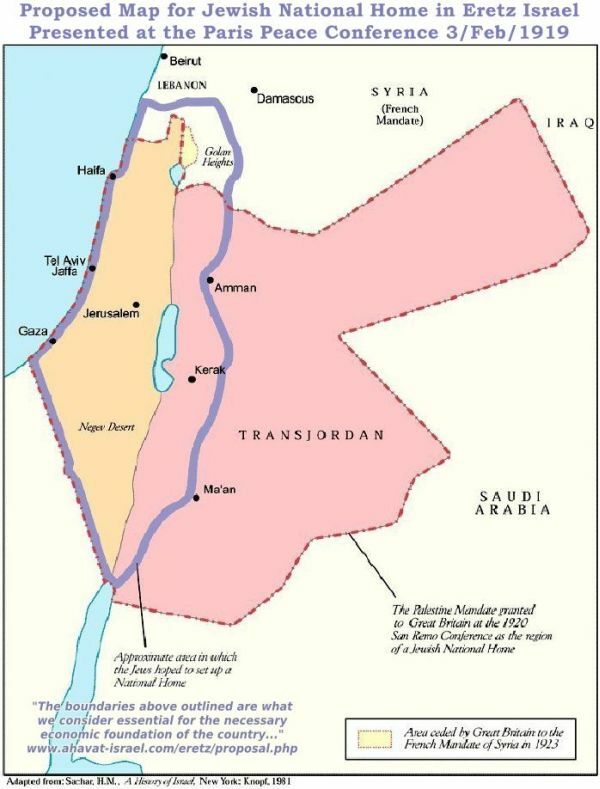 UN Partition Plan of 1947. The magnitude of the Holocaust, with the extermination of approximately 6 million Jews, helped sway world opinion that a Jewish Homeland was needed. The United Nations created a partition plan which was approved by the Jewish Assembly. This partition was voted on and approved by the United Nations on 29 November 1947. War began immediately after. Egypt, Syria, Lebanon, Iraq and Jordan invaded. British RAF fighter aircraft escorted and flew along side Egyptian attacks. Four British fighter aircraft were shot down by the Israeli's on January 7, 1949. As the Israeli Constitution guaranteed the free practice of religion, Arab residents of the lands partitioned to Israel were encouraged to stay. Citizenship would be granted with all rights of any other citizen. However, this was discouraged by Muslim leadership. Israel declared independence and the formation of the Nation of Israel on May 14, 1948. The War of Independence ended in 1949. Additional wars would follow. In the Six Day War of 1967, Israel captured the Golan Heights- the source of repeated shelling of Israeli settlements in the Galilee- East Jerusalem- site of the Wailing Wall and the Dome of the Rock, as well as the West Bank, which had been occupied by Jordan. The Treaty of Versaille, the Treaty of Sèvres and the Sykes-Picot Agreement are, without question, the catalyst of many problems in the Middle East, as well as contributing to causing WWII. In May 2016, on the 100th Anniversary of Sykes-Picot, ISIS released a statement staying, in part "By Allah’s permission, the coming days will witness more events that result in removing borders of Sykes-Picot..." Sykes-Picot can also partially account for the number of ISIS attacks against France. parties involved. However, it also cannot be denied that despite the Mandate under the League of Nations, no nation of Palestine ever existed as an independent state. Historically, there has never been a nation known as Palestine. Palestine and Palestinians are a modern name applied to those Arabs who left their homes in the 1948 War-- a war begun by Arab Nations with standing militaries against a people who had to smuggle, build or use any firearm they could find- including Winchester rifles used by the US Cavalry in the 1800's. Despite beginning the war, and encouraging the displacement of Arab inhabitants, the Arab nations have also done little to assist the dislocation of those peoples. Should there be a nation of Palestine? Although one has never existed previously, there probably should. Israel has previously given up land for peace to facilitate this- including the Sinai, which was captured from Egypt in the Six Day War. Should Israel give up Jerusalem? I cannot say no loudly enough. Should the Obama Administration pull an 11th Hour Stunt in the Security Council and demand Israel give up Jerusalem or create a Nation of Palestine within the borders of Israel? ABSOLUTELY NO. History shows that having the "West" redraw the maps of the Middle East, only leads to death, destruction and war. Let the people of the region come to their own solution, rather than imposing one.